In Store: Print out this coupon or show on your smartphone to get $15 off your entire purchase $75 or more, valid at Kirkland's stores. Print a coupon instantly after sign up for a $10 discount on your entire in-store purchase of $50 or more. The coupon will have an exclusive bar code that can be used only once. Here's a preview of the coupon that you will receive. - See All Current Printable Coupons For Retail Stores. In Store: Spin the wheel on their app for a chance to win up to 25% off any one regular priced item. 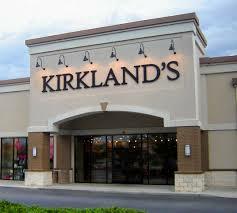 Printable Coupon: Save 30% when your purchase any one item at regular price at Kirkland's stores. Printable Coupon: Present or show these coupons to the cashier and get up to $50 off $200 storewide. Get 25% off at Kirkland's stores on any single item purchase, excludes christmas and furniture, print or show coupon on mobile phone to redeem. Get a 25% discount storewide. Valid at Kirkland's retailers nationwide. Print or present this coupon on your smartphone. In Store coupon not required, get 15% off your entire in store purchase. Valid at your local Kirkland's store. In-store only, print coupon and save 20% off any single Christmas item. Shop at Kirklands store today and save $20 if you spend over $100. Kirkland's is a great store when you are ready to decorate, redecorate, or just spruce up your home. Follow their special offers and in store discounts on this page to get the perfect opportunity to buy that new headboard, dining table, or any home furniture at a lower cost. Kirkland's carries everything from accent pillows to room lighting to wall décor. Enjoy their coupons above for extra savings both online and in store.